The Cutter effect can be used with 2D-3D integration. Rendered 2D drawings, integrated with 3D models, display soft, anti-aliased edges, even where the Cutter effect is applied. 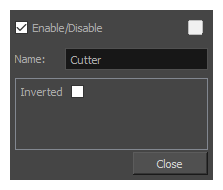 To learn more about using the Cutter node, see Using the Cutter Node.